CPO vehicles come with limited warranty coverage as well as other benefits, like roadside assistance that you would normally get when purchasing a brand-new vehicle. CPO vehicles also come with vehicle history reports so you can see service records, accident reports, & more. CPO vehicles are put through a multi-point inspection prior to being certified by the dealer to ensure that repairs were made if necessary, so you’ll be driving around town knowing your car hasn’t been neglected when it comes to servicing and repairs. 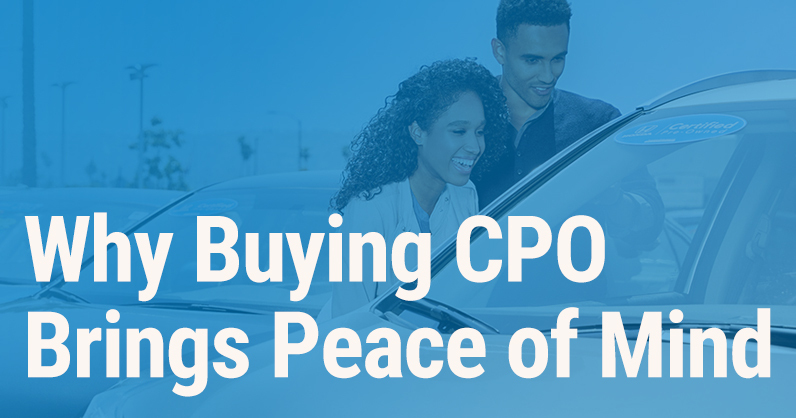 Often times, these CPO programs will offer special financing deals that are comparable to new-car financing rates, which could save you some extra cash up front during the initial purchase. A good amount (if not most) of the CPO vehicles you find may be lease returns that are gently used over a 2-3 year period, and return to the dealership with less than 36,000 miles on them. CPO programs exclude vehicles that have been in major accidents or have had any structural or damage to the vehicle frame.